Belinda Hadfield is an Authorised Senior Instructor of the Tse Qigong Centre and teaches the traditional Chinese health skills, Wild Goose (Dayan) Qigong and Chun Yuen Quan. I live on a lifestyle block on the Kapiti Coast, New Zealand with my husband Anthony, and a variety of pets. With a fairly large family home that is no longer occupied with our children, we often enjoy the company of friends, family and visitors from overseas. As well as offering tuition in Wild Goose Qigong and Chun Yuen Quan, and with some help from Anthony, I manage my family's farm. My studies with the Tse Qigong Centre commenced when I accompanied Anthony on a Healthy Living Gong seminar with Sifu Neale Svenson in early 2001. Anthony was looking for a way to manage stress and I went along mainly in support of him, even though my health was not good having developed long term health issues after a bout of Glandular Fever. I was in for a surprise as after one day of Healthy Living Gong, I experienced a change in my being that encouraged me to pursue Qigong. From then on, I regularly attended Sifu Neale's classes in Wellington to further my learning and understanding of the Kunlun Dayan Qigong System. In 2003 I was invited by the Tse Qigong Centre to attend the Wild Goose Instructors' Course in England and when Sifu Neale left New Zealand, I took over as Instructor of his Kapiti Coast class. New Zealand Instructors and students enjoy a close relationship with the Tse Qigong Centre. Master Michael Tse of the Tse Qigong Centre visits Australia and New Zealand annually and along with holding seminars and giving demonstrations, he spends valuable time with the Instructors helping them to develop their skills. 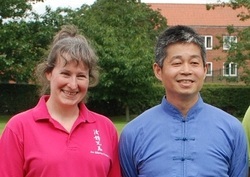 In addition to Master Tse's visits, Authorised Instructors of the Tse Qigong Centre travel to England, often annually, to attend the Wild Goose Instructors' course where their forms are further developed, polished and tested, thus ensuring a high standard of skill is maintained. I am very grateful for the guidance and support provided by the Tse Qigong Centre and especially from my Sifu, Jessica Tse and my Sigong, Master Michael Tse. With good health now the norm for me, in early 2015 I suggested to Anthony that we had an adventure. So from October 2015 to January 2018, Anthony and I walked, in large sections at a time, Te Araroa (The Long Pathway), a 3000km journey through New Zealand, starting at Cape Reinga and ending in Bluff.